https://rising.globalvoices.org/files/2019/01/Peter-carrying-out-the-out... 400w, https://rising.globalvoices.org/files/2019/01/Peter-carrying-out-the-out... 768w" sizes=" 800px) 100vw, 800px" />Outdoor network deployment. Photo provided by Josephine Miliza and used with permission. This country report was written by Josephine Miliza of the Tunapanda Institute. Please visit the GISWatch website for the full report which is also available under a CC BY 4.0 license. Kenya, one of Africa’s fastest growing information and communications technology (ICT) markets, has a long-term development plan, Vision 2030, that aims to transform Kenya into a knowledge-based economy by utilising ICTs for national development and growth.1 In the 2017/2018 second quarter statistics report released by the Communications Authority of Kenya, mobile subscriptions recorded a growth of 4.4%, rising from 41 million to 42.8 million. The mobile penetration level reached 94.3%, up from 90.4%. Data internet subscriptions recorded an 8% growth – 33.3 million up from 30.8 million subscriptions. Nairobi is the country’s largest and capital city, with an estimated population of 3.5 million, and slums hosting almost three-quarters of this population. Kibera is Nairobi’s largest slum, located seven kilometres south of the city with an estimated population of 500,000 to 700,000. Residents of Kibera suffer from poverty, inadequate food and water, rampant diseases and few educational opportunities. A majority of the residents live on under a dollar a day. 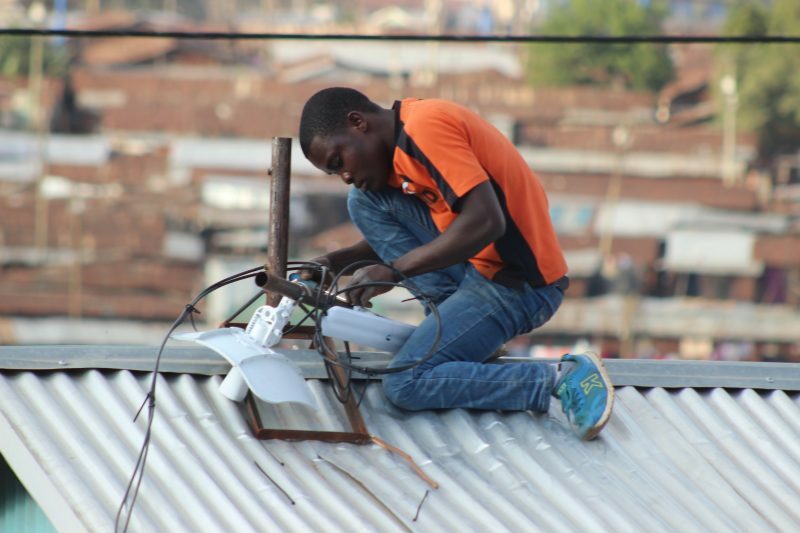 Community networks can be defined as a bottom-up approach to meeting community connectivity needs. These needs vary from one community to another; as a result, these networks have different motivations for starting. Kenya, like many countries in Africa, is still new to community networks. This report focuses on the TunapandaNET community network, the only one in the country. TunapandaNET is an urban community network operating in Kibera. It is a project of the Tunapanda Institute, a non-profit social enterprise that runs intensive three-month technology, multimedia design, and business training courses in extreme low-income environments in East Africa, such as Kibera and Turkana in deep rural Kenya. These programmes enable young people to become digital professionals, and to gain skills and mindsets to empower other youth in their communities through peer-to-peer learning. The organisation has produced 400 graduates in the past four years. 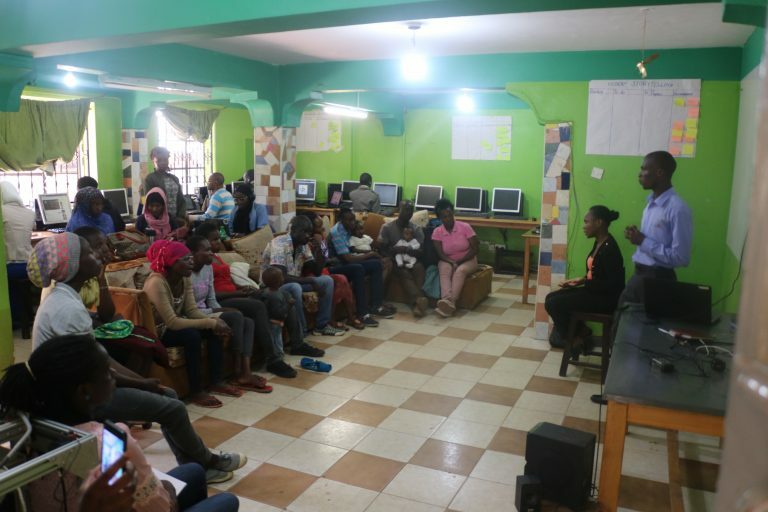 The TunapandaNET community network was started to help the institute reach more youth in Kibera, since the institute can only accommodate 30 trainees per cohort. In 2015, the institute started developing a gamified e‑learning platform called Swag. Swag is an open source software system – for web and Android – that enables individuals and groups to access offline multimedia educational content without needing access to the internet or highly trained teachers. 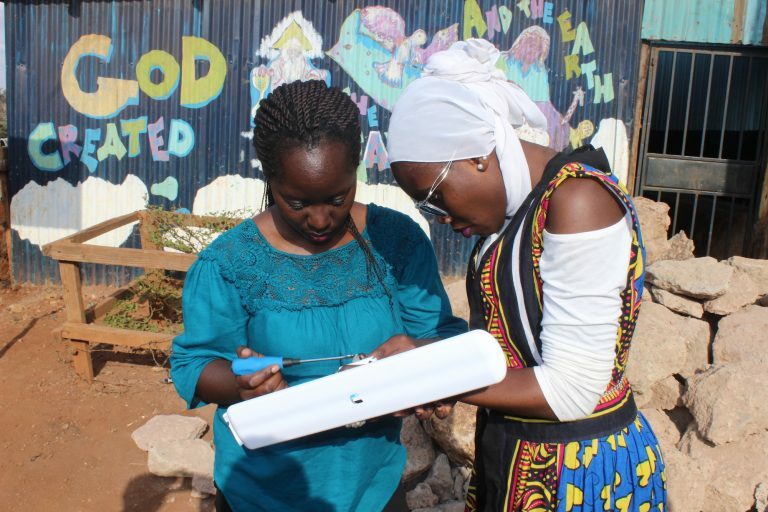 The initial goal was to connect the institute to three partners in Kibera through a wireless mesh network. The partners would serve as hotspots where youth would access the e‑learning platform. https://rising.globalvoices.org/files/2019/01/Josephine-Miliza-and-Habib... 400w, https://rising.globalvoices.org/files/2019/01/Josephine-Miliza-and-Habib... 768w" sizes=" 800px) 100vw, 800px" />Josephine Miliza and Habiba Juma during network deployment. Photo provided by Miliza and used with permission. Two breakthroughs came in 2016. First, in March 2016, two of the team members were selected to attend a workshop on the internet of things (IoT) and networking for developing countries at the Abdus Salam International Centre for Theoretical Physics. During the training sessions, they presented the mesh network idea to workshop organisers Marco Zennaro and Prof. Ermanno Pietrosemoli, who gave them some pointers on configuring Ubiquiti equipment and donated some routers to the project. The team also met Arjuna Sathiaseelan and Adisorn Lertsinsrubtavee, who also had experience in community networks and offered very valuable advice on how to move forward with the project. Before the workshop, the team was not aware of the term “community networks” and the significance of setting up a community structure that allowed the community to manage its own access needs. Their idea was simply a technological solution to solving the challenges of high bandwidth costs and access to digital educational content. They were introduced to successful community networks such as guifi.net in Catalonia and TakNet in rural Thailand, which they could draw lessons from. The second breakthrough was meeting Carlos Rey-Moreno from Zenzeleni Networks in South Africa, who was carrying out research on existing community networks in Africa. Following the “Map of the Community Network Initiatives in Africa” report, the first Summit on Community Networks in Africa was held in November 2016, supported by the Internet Society. During the summit, the team met other operators in Africa and shared the challenges they were facing in establishing their network in Kibera. From these discussions, the network operators formed a support group championed by Carlos, Jane Coffin and Michuki Mwangi from the Internet Society to address the issues they were facing. Three areas were identified as areas of great value to the community: education, health and business. Deployment was planned in three phases, with the education pillar being first. 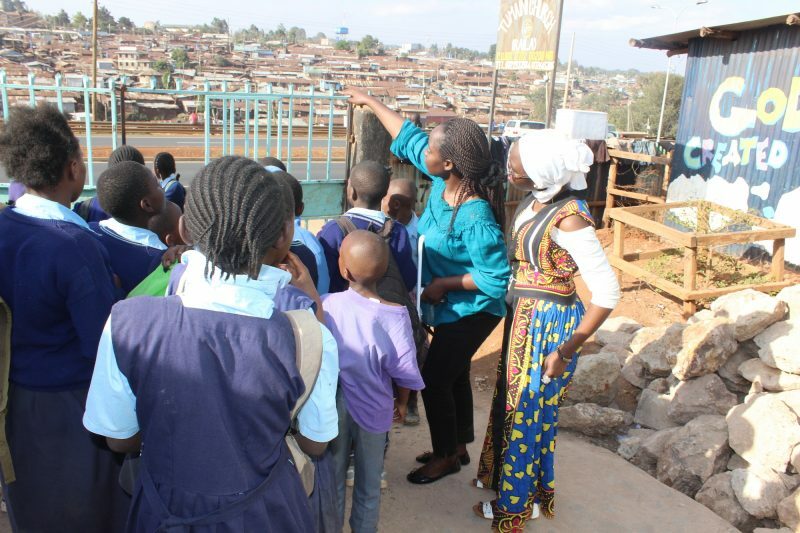 Kibera has over 300 educational institutions, most being low-cost, privately run, informal schools. Most of these schools are run by religious institutions and non-governmental organisations serving vulnerable children and youth. They face challenges such as lack of trained teachers, poor infrastructure, and a lack of learning resources due to high costs. https://rising.globalvoices.org/files/2019/01/Dennis-Lighare-training-yo... 400w, https://rising.globalvoices.org/files/2019/01/Dennis-Lighare-training-yo... 768w" sizes=" 800px) 100vw, 800px" />Dennis Lighare training youth with hearing impairement on digital storytelling and mobile photography at Tunapanda Institute. Photo provided by Josephine Miliza and used with permission. In 2017, through a partnership with the Internet Society, the International Centre of Theoretical Physics and Rhinotivity (Denmark), TunapandaNET deployed four nodes serving two schools with over 1,500 students and a youth centre serving 300 local youths. The network provides access to offline educational resources and capacity building for the different network user groups. In 2018/2019, the network will be expanding to 10 additional centres – seven schools, two youth centres and one women's centre. This will be done in partnership with the Internet Society Kenya Chapter through the Internet Society's Beyond the Net Funding Programme. The seven schools have a total of 2,900 students while the community centres will be adding 550 users to the network. It is estimated that the network will have 5,000 users by 2019.
https://rising.globalvoices.org/files/2019/01/Josephine-and-Habiba-expla... 400w, https://rising.globalvoices.org/files/2019/01/Josephine-and-Habiba-expla... 768w" sizes=" 800px) 100vw, 800px" />Josephine and Habiba explaining to pupils at Tumaini primary school on how the network works. Photo provided by Miliza and used with permision. In 2016, Tunapanda started an initiative called Tech Dada (Tech Sisters) to address these challenges through a mentorship programme for girls aged 14 to 20, and offering digital literacy training for women. These programmes are done in partnership with centres connected to the TunapandaNET community network. The initiative has in the past partnered with Plan International Kenya through the Adolescent Girls Initiative Kenya, which provided online safety training for the programme’s peer mentors. It has also trained local women champions in Kibera through the Women Voices programme, which used ICTs to amplify women's voices in governance issues in Kibera. For more information regarding action steps for Kenya, please visit the full report on the GISWatch website.